My question is rather specific but I'm wondering if someone might be able to help. In the Solvency 2 framework, the equity capital charge requires to compute a symmetric adjustment which is itself computed as the difference between the current value of an equity index and its average over the last 36 months (1). 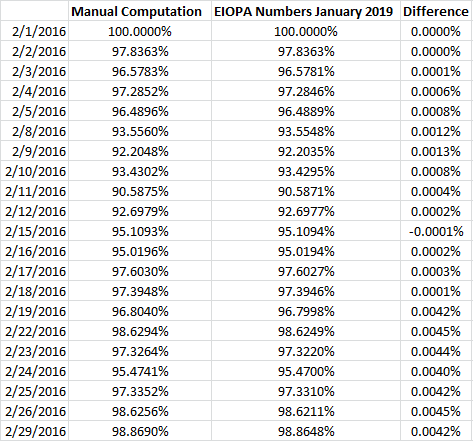 If I follow all the steps outlined in the EIOPA document published monthly (picture below), I get an almost perfect match for the first few dates after the date used for normalization and then my calculation and the one published start to diverge more and more (as shown in the picture below). My guess is that there might be dividends coming in play and that might be the reason of this growing discrepancy. However I am not sure how to correct this. I download data from Bloomberg (field PX_LAST) and the EIOPA documentation states that price indices should be used (not total return indices). Browse other questions tagged equities index solvency-ii or ask your own question. How can index futures trade 24/7 when the index doesn't change? Does the correlation between stocks in an index affect the implied volatility of the index?